A third Alameda County sheriff's deputy is now on paid leave for possibly stealing from a suspected car thief whose beating was caught on surveillance video. Michael Haddad, an attorney representing the suspect, is also expected to announce on Tuesday a civil lawsuit against the Alameda County Sheriff's Office. Haddad reportedly alleges a third deputy used a necklace stolen from the suspect, Stanislaus Petrov, to bribe witnesses to not report the beating. "Sheriff Ahern learned last week about what Mr. Haddad is alleging and he has since placed another deputy on administrative leave," Alameda County Sheriff Office Sgt. J.D. Nelson said. The necklace is seen in crime scene pictures, but has since disappeared. "If those allegations are true, the deputies who took items off Mr. Petrov and gave them away are no better than the criminals they've arrested," Haddad said. After months of saying no deputies activated their body cameras during the beating, the sheriff's office on Monday said one of the deputies in the video may have accidentally done so. "I can't say he knew he had it on when we talked to him," Nelson said. "He's not working now and I can't ask him." Petrov allegedly stole a vehicle in Alameda County, rammed two squad cars and led deputies in a high-speed chase into San Francisco before being tracked down in a Mission District alley. 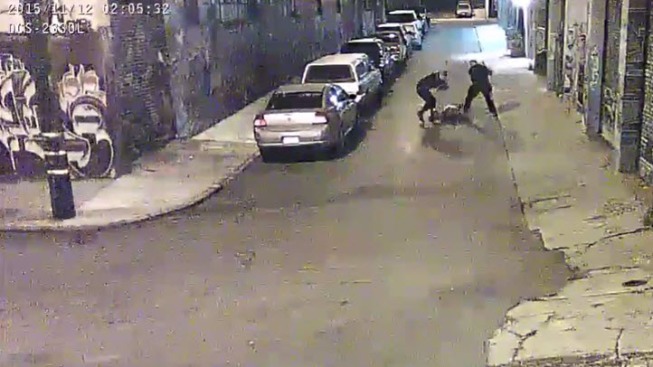 Surveillance video, uploaded on Nov. 12, and released on YouTube by the San Francisco public defender's office, shows two deputies chasing a man on foot. As the man slows, one deputy tackles him and punches him twice. The second deputy arrives and starts hitting the man with his baton. Soon, both deputies hit him with their batons as he screamed and alternated from laying on the ground and getting on his knees. The Alameda County deputies, who were not identified, were placed on leave two days after the release of the video, which launched an internal investigation. 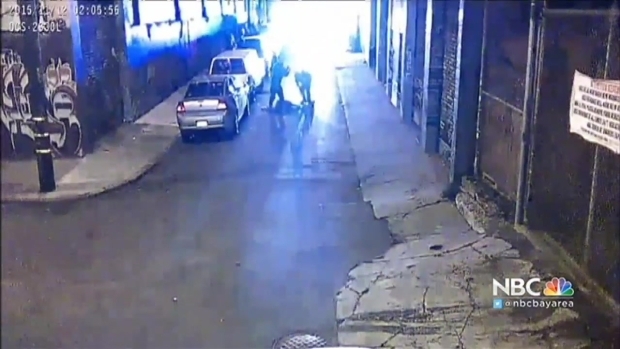 Two Alameda County sheriff's deputies seen repeatedly beating a suspected car thief in a video were placed on paid administrative leave on Sunday, and one public defender is asking prosecutors to consider filing charges against the pair. Marianne Favro reports. The sheriff's office on Monday said there is no excuse for what was seen in the video. "We get a little ticked off when things like this happen because it tarnishes my badge and it tarnishes everybody's badge, and we don't like it," Nelson said.